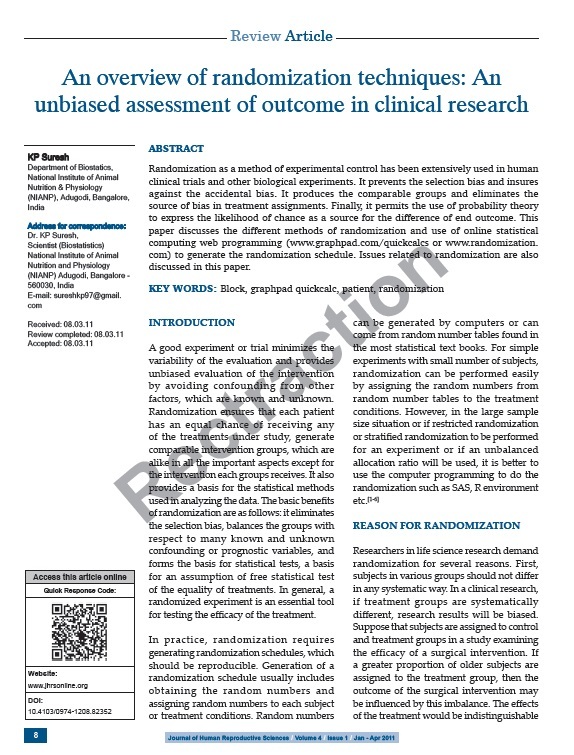 In the article titled, "An overview of randomization techniques: An unbiased assessment of outcome in clinical research", which was published in pages 8-11, Issue 1, Vol. 4 of Journal of Human Reproductive Sciences1, overlap of text has been found with a previously published article, titled, "Issues in outcomes research: an overview of randomization techniques for clinical trials. ", in pages 215-221, Issue 2, Vol. 45 of Journal of Athletic Training2. Thus owing to duplicity of text, the article is being retracted. 10 Can isosorbide mononitrate be useful in second trimester termination of pregnancies? Mousiolis, A. and Sindos, M. and Papantoniou, N. and Antsaklis, A.
Scrivani, P.V. and Erb, H.N. 12 Can isosorbide mononitrate be useful in second trimester termination of pregnancies?